Lucky Santa is here! 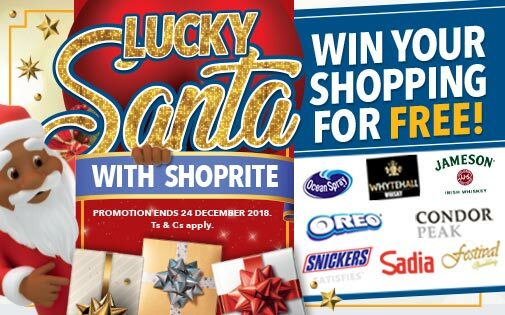 We’re giving 1000s of lucky customers the chance to WIN their Christmas SHOPPING FOR FREE at Shoprite! It has never been easier to get MORE for LESS – simply enter while you shop for low price deals! 1. Buy any 3 of the participating brands. 2. Check your till slip to see if you are an INSTANT WINNER! Find your nearest store and enter today! Ts & Cs apply. Promotion ends 24 December 2018.